It’s that time again for the monthly favorites. Time goes by so fast! Every month I will tell you guys what my favorite items were that month. Most of my favourites were the same as last month, but there are a few new ones. 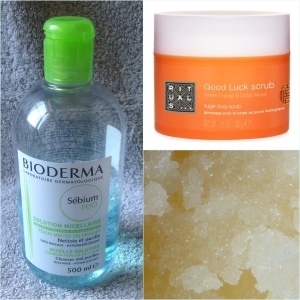 I still love my Bioderma solution micellaire to clean my skin and to use as a make-up remover. Another thing I use every time is my Good Luck Scrub from Rituals. It has an awesome orange/cedar smell. The products from Rituals feel very luxurious. For make-up I have a few new favorites. First is a lip product from Rimmel. It’s the Apocolips in the color Stellar. Another new favorite is the Essentiel jumbo lip gloss stick in the color Movie star from ELF, which is a red color. I like it because it glides on easily and is not sticky, and another great thing, it only costs 2,50€ (= 2$). Another product I use constantly and love is my EOS lip balm in the scent summer fruits. I use this as a sort of base for my lips so they stay hydrated. Over to eye make-up, I’m still in love with my Inglot freedom palette. Another little palette that I used a lot and enjoyed using is my Wet & Wild (walking on eggshells), especially the color for the eyelid. I still use my Mac paint pot in the color bare study as my eyeshadow base. It’s a champagne-pink sort of color. When I don’t want to wear to much make-up I just use this as my eyeshadow color. As mascara I used my Maybelline the Rocket daily. I don’t realy have a nailcolor favorite this month, but I did love my Seche Vite fast drying top coat. It is a life saver when you want to repaint your nails often or when you just painted them and you need to go out the door. I don’t have any fashion favorites this month. The weather changed a few times and therefor I was always wearing different things. I do have 2 accessories as a favorite though. I wore my Tiffany & Co necklace practically every day, and I’m still in love with it. It is one of those pieces that you could always wear. I picked this up when I was in New York with my friends, I wanted something from Tiffany’s and something that I could wear all the time. That’s why I chose the letter N for my name and the hart-shaped Tiffany’s pendant. Another item I wore all the time is my Fossil watch. 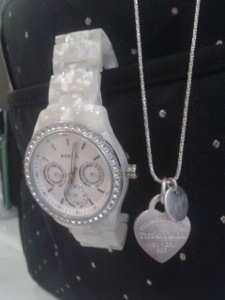 It is a marble white one with stones around the actual watch part. That were all my favorites this month. What were your favorites in August? 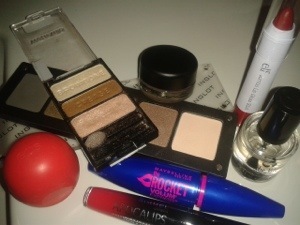 This entry was posted in monthly favorites and tagged August favorites, bioderma, elf, eos, eyes lips face, inglot, mac, maybelline, montly favorites, rimmel, rituals, seche vite, tiffany and co by missnathaliexo. Bookmark the permalink. Great post! If you had a chance I’d love if you could check out my August favorites!